Offering you a complete choice of products which include vertical three pass wood coal thermic fluid heaters, thermic fluid heater, vertical three pass thermic fluid heater, hot gas thermic fluid heater, oil gas fired thermic fluid heater and solid fuel fired thermic fluid heater. 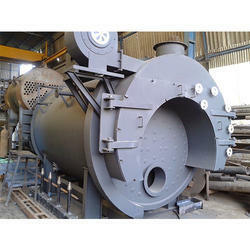 We are leading manufacturer and exporter of Vertical Three Pass Wood Coal Thermic Fluid Heaters. The VFF-series, vertical four pass F.B.C fired Thermic Fluid Heater is designed for maximum efficiency, using a variety of free flow fuels including agro waste fuels and pulverized coal. It allows high process temperatures at low operating pressures. The combustion system for free flow fuels consists of fuel feeding threw screw feeder handling and stoking equipment, in refractory lined chamber, air and flue gas handling system (including I.D. fan and F.D. fan) with blowers and pollution control equipment. The furnace construction is done on site (only for bricks works). It includes foundation, fabrication and erection of supporting structure, building up refractory chambers, fixing up firing doors, ash doors, access doors, air plenum chamber and air nozzle. Available in 1,00,000 kcal/Hr. to 1,000,000 kcal/Hr. Note : Price will change as per Design, Capacity, Pressure, Fuel, etc We are one of the major Electric Thermal Fluid Heater Manufacturers in the country. Our Electric Thermal Fluid Heaters are fully automatic in mode and thus very easy to operate and control. They are offered in both vertical as well as horizontal coil types. 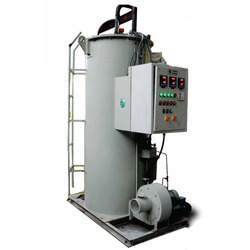 Our company is engaged in offering a comprehensive range of Vertical Three Pass Thermic Fluid Heater. These offer maximum efficiency and low pressure operations even at higher temperatures. We offer this in the different capacity ranging which makes use of fuel oil, coal or agro waste. 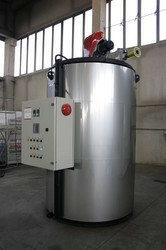 We offer this Vertical Three Pass Thermic Fluid Thermal Oil Heater at industry set standard sizes. 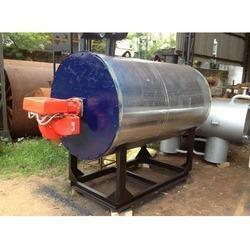 We are leading manufacture and trader of Hot Gas Thermic Fluid Heater. 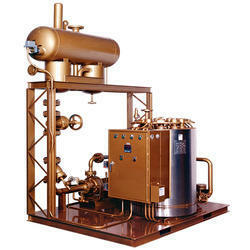 We are leading manufacture and trader of Oil Gas Fired Thermic Fluid Heater. We are also engaged in manufacturing, supplying and export of Solid Fuel Fired Thermic Fluid Heater that works with fuels like wood, coal, agro waste and biomass. Our range is manufactured with high quality material of construction obtained from reliable vendors in market. We have experienced professionals, who use latest techniques in the manufacturing process for better results. Our range can be availed by our customers in various specifications and we also customize them as per the need of customers. 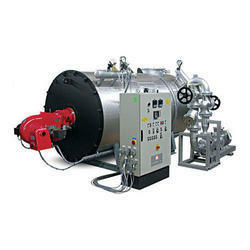 We bring forth an impregnable range of Horizontal Thermal Oil Heater Three Pass. These can be used with gas, oil, coal. They allow high process temperatures with low operating pressures. 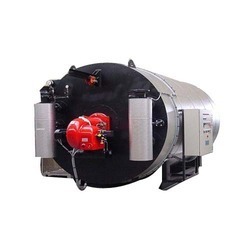 This high grade horizontal three pass thermal oil heater is very popular due to its renowned features such as sturdy make, premium quality, efficiency and optimum reliability. 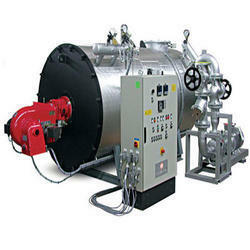 We bring forth an impregnable range of Waste Heat Thermic Fluid Heater. These are offered in various dimensions to ensure efficient performance, high resistance and high conductivity. 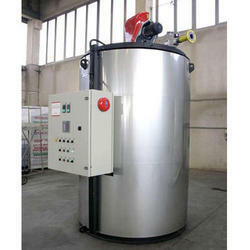 This Fluid Heater ideally suited for collecting waste from factories and industries and process at heat system. 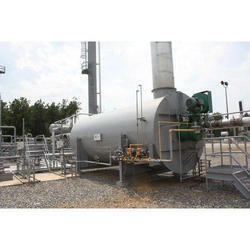 We offer this Waste pack Thermic Fluid Heater at market competitive prices to gain optimum client satisfaction. Efficiency Overall efficiency of 70 % (+/-2%) on NCV with APH. 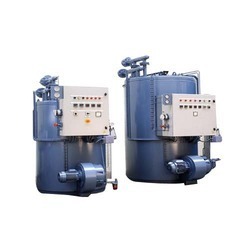 Horizontal Three Pass Thermic Fluid Heater, Owing to our vast experience in this industry, we manufacture and supply Three Pass Manual Fired Thermic Fluid/Thermal Oil Heater that finds enormous usage in various industries. Our range is highly appreciated for their efficiency and performance. We check the quality of the complete array at various stages to ensure only flawless products are delivered to customers. The VTM- series, vertical three pass solids fuel fired thermic fluid/thermal oil heater is designed for maximum efficiency, using a variety of solid fuels including agro-waste fuels. It allows high process temperatures at low operating pressures. The combustion system for solid fuels consists of fuel handling and stoking equipment, refractory lined chamber, air and flue gas handling system (including I.D. fan and F.D. fan) with blowers and pollution control equipment. The furnace construction is done on site (only for bricks works). It includes foundation, fabrication and erection of supporting structure, building up refractory chambers, fixing up firing doors, ash doors, access doors, support bars for fire grates, grate bars, etc. Efficiency: Overall efficiency of 70 % (+/-2%) on NCV with APH. Efficiency Overall efficiency of 76 % (+/-2%) on NCV with APH. 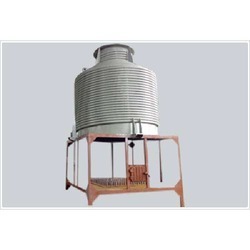 With the support of our highly experienced professionals, we manufacture and supply Vertical Four Pass Manual Fried Thermic Fluid Heater that are used for agro waste fuels and pulverized coal. These heaters are efficient in processing high temperatures at low operating pressures. We check the quality of these products at various stages to ensure only qualitative range is delivered to customers. The VFF-series, Vertical Four Pass FBC Thermic Fluid Heater is designed for maximum efficiency, using a variety of free flow fuels including agro waste fuels and pulverized coal. It allows high process temperatures at low operating pressures. The combustion system for free flow fuels consists of fuel feeding threw screw feeder handling and stoking equipment, in refractory lined chamber, air and flue gas handling system (including I.D. fan and F.D. fan) with blowers and pollution control equipment. The furnace construction is done on site (only for bricks works). It includes foundation, fabrication and erection of supporting structure, building up refractory chambers, fixing up firing doors, ash doors, access doors, air plenum chamber and air nozzle. 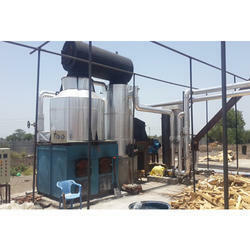 We are the most prominent firm offering highly efficient Vertical Four Pass FBC Thermic Fluid Heater. Tank Capacity 1,00,000 kcal/Hr. to 1,000,000 kcal/Hr. We are one of the major Electric Thermal Fluid Heater Manufacturers in the country. Our Electric Thermal Fluid Heaters are fully automatic in mode and thus very easy to operate and control. They are offered in both vertical as well as horizontal coil types. We are engaged in manufacturing Solid Fuel Fired Thermic Fluid Heaters.